First-round leader Kim Hyo-Joo regained the lead of the Evian Championship in France after rival Brittany Lincicome struggled in Saturday's third round. 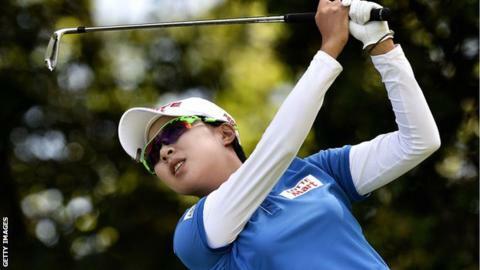 United States player Lincicome had led Korean teenager Kim by one stroke at the halfway point of the major. But while Kim matched the 72 she fired on Friday, Lincicome could only manage a six-over-par 77 which left her back on two under, four shots off the lead. Australia's Karrie Webb is second on seven under, one shot behind Kim. Webb, 39, who won the last of her seven majors in 2006, said: "I'm just happy to be in this position. It's been a while. "I was proud of the way I scrambled today and I've got a lot of friends here so it would be great to win my eighth major tomorrow." If Karrie Webb triumphs on Sunday, she will have won six different majors. She has previously won the US Women's Open (2000 & 2001), Kraft Nabisco Championship (2000 & 2006), LPGA Championship (2001) and the du Maurier Classic (1999) which was replaced as a major in 2000 by the Women's British Open, which Webb won in 2002. Kim, 19, hit five bogeys - including four on the first nine holes - on a day when many players struggled with some difficult pin positions. After Friday's blemish-free 65, Saturday's round began badly for Lincicome when she sent her first tee shot down the adjoining 18th fairway, her third shot into a bunker - recording two double bogeys in the first two holes. "I feel like I did all the same things I did yesterday. The bunkers? I mean, there is so much silly sand in these bunkers. It's impossible to get it out," the 28-year-old said. Lincicome and defending champion Suzann Pettersen of Norway are among 11 players within five shots of the lead going into Sunday's final round. England's Charley Hull, the highest-placed Briton, is tied for 23rd place on one over par despite firing a 70, her best round of the tournament.